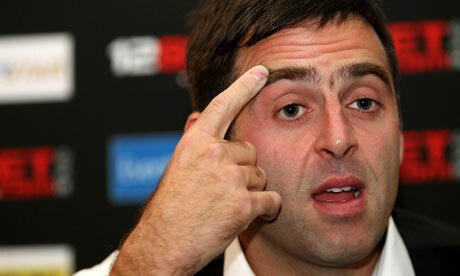 Ronnie O'Sullivan defeated Jimmy White to set up a last-16 match against Stephen Hendry at the World Open in Glasgow. Ronnie O'Sullivan's 3-1 win over Jimmy White to reach the last 16 of the World Open in Glasgow exposed the falsity and perhaps malice of a rumour of uncertain origin, circulated by email, that O'Sullivan would lose on purpose because he owed White a favour. Neither O'Sullivan, in an 18-year professional career, nor White, in one of 30, has ever had a whiff of suspicion attached to them for such a malpractice. David Douglas, the high‑ranking former Scotland Yard policeman who has special responsibility, as a member of the World Professional Billiard and Snooker Association board, for the integrity of the circuit's matches and disciplinary matters generally, was made aware of the situation just as the match started and afterwards commented: "This was an unsubstantiated rumour to which no credence should be attached" – a judgment of course emphasised by the result. White, 48, now languishes at 66th in the rankings and rarely qualifies for the televised phase of tournaments. Slow to settle on that account, he was quickly 2-0 down but began to look more like the player who reached six world finals in his prime by stitching together a frame‑winning 88 in the third. It could easily have been 2-2 if White, in with 56 and beginning to fancy his chance, had not missed a tricky red to a middle pocket. As it was, O'Sullivan rose unperturbed from his chair to make the nerveless 80 clearance which put him through to play Stephen Hendry tomorrow for a place in the last eight. It was a match that illustrated how fine is the line between winning and losing in a mere best-of-five contest. The players are enjoying the event and the crowds have found it entertaining but the consensus is that it carries too many ranking points, particularly in the light of its random draw with no seeding, in comparison with others that start at the best of nine. Whatever the distance, though, a crisis point usually arrives at which leading players make their class, composure and self-belief tell – as O'Sullivan did. Afterwards he took the opportunity to emphasise that his reluctance to pot the last black of his 147 break on Monday in protest against the absence of a bonus prize for a maximum was only in the spirit of playful provocation. "I'm a bit of a showman and I like to be given a bit of stick sometimes because I need reasons to play," he said of some of the criticisms which come his way. "I don't care about money. I live on a shoestring. I'm a bit of a hermit. I like to wind people up sometimes." Even so, among the players, there seems to be a consensus in favour of a bonus of some sort for a 147, even if it is not of the order of the £20,000 they could expect in previous seasons. A prize for the most maximums in a season has been mooted. I wonder if other top players are the targets of such libellous spams also. Disgusting. He won anyway so this is a bit of a non-starter. Bourne wrote: He won anyway so this is a bit of a non-starter. Of course it is now. It was circulated before the match. There are a lot of rumours going round on the Internet in general, but this in the current context was nasty. I'm glad though that there seems to be much more transparency about such things nowadays. I just wonder how often it happens and if any of you has any knowledge of similar things targetting other players. Yes obviously a rumour else he would have won! pointless thread and comment. randam05 wrote: Yes obviously a rumour else he would have won! pointless thread and comment. I don't think it's a pointless thread. I remember some 2 years ago a poster coming first time on TSF with a picture of Neil Robertson apparantly kissing a guy in a gay party. I asked for that thread to be removed. For a start even if the picture had been genuine, that would have been a breach of Neil's privacy. Next I had serious doubts about it being "genuine" in the sense that some pictures/quotes/videos taken out of context can be totally misleading. Someone was clearly at it to rubbish Neil's image. This email is another example of an attempt to damage a player's image. If you were on streamings with chatboxes you would be apalled at the number of false and nasty things that are circulated and said there. It is disgusting, no other word for it. When anyone misses now, what they believe to be easy balls, unfortunately, people are going to jump on this as 'strange', lets call it. We, as lovers of the game, are going to have to dumb down this type of marmite. Excuse my language. You'll usually find that this type of marmite, will come from people not high up in the game or have never played the game to any decent standard, thus not knowing how difficult the game is to play in the first place. I've been keeping an eye on the Cricket of late, seeing how they have dealt with it. Nice & relaxed is how I have perceived their game when it is trying to be tarnished. As said at the top, it is disgusting &, a bloody shame too. well just think of what would happen if Ronnie lost a 2-0 lead which he almost did and coupled that with Missing the Balls he missed that Made the Burnett miss look like a impossible pot. Thank God Ronnie won is all i got to say. Snookerfan said it the other day, it's pretty sad we've got to the stage where any time a player is missing balls that people are immediately thinking 'fix' ... it's definitely a problem and not only in snooker that's for sure, that's why it needs the likes of Hearn and Stevens to put a firm fist down to stomp it out on the troublemakers. The people who call 'fix' at every miss don't play the game, that's the only conclusion I can come to. Exactly take the sort of pressure you get from two amateurs playing in the snooker club and times that by a million and then you get close to what these pros have to deal with. Well I'm glad Ronnie won because with this rumour and some of the balls he missed it would have spread like wildfire. Bourne wrote: Snookerfan said it the other day, it's pretty sad we've got to the stage where any time a player is missing balls that people are immediately thinking 'fix' ... it's definitely a problem and not only in snooker that's for sure, that's why it needs the likes of Hearn and Stevens to put a firm fist down to stomp it out on the troublemakers. Thank you for remembering my wisdom, young one. It's getting silly now. We'll be examining the black balls missed in the 1985 final next. If there's no proof, there's no claim. We should give this nonsense the respect it deserves, and ignore it. I hate this type of nonsense, just makes you want to pack up watching sport. Society breeds cynical and suspiscious minds, and although I'm not naive enough to think that fixes and the like cannot happen, most pro sportsmen have enough self respect to get out there and on with it. Good showing from JIm on all accounts, hope he can keep it up. To be honest here, some of the shots Ronnie missed were very uncharcteristic from him and i would be lying if the thought of Ronnie missing on purpose did'nt enter my mind. I dont believe it for 1 second but i did entertain the thought. I put it down to Ronnie just being incredibly nervous (i know that sounds strange as he is a 3 times world champ) playing his boyhood hero. I remember coming through the ranks in Rugby and being a decent player until playing along side the legend that is Mick Galwey. I so wanted to play well that i had the worst game ever and was dropped. Ronnie is not alone in being targetted by email attacks, many top sports stars have to put up with it.. Remember the death threats on David Bekham after 1998? Its sad and it should'nt happen but unfortunately these freaks will exist long after we are all gone. No-one like splash back, in fact its the worst thing about snake hissing outdoors when its windy.